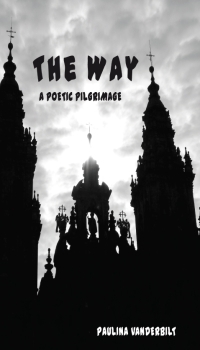 Paulina Vanderbilt's The Way: a poetic pilgrimage, a collection of poems enriched with information on the Camino de Santiago de Compostela, Galician folklore, traditions and even cuisine, was called a "lively mix" by Anna Crowe, who also describes the poetry as having "great verve and freshness and evoking landscapes and people with immediacy and empathy". The book was launched at an event co-promoted by Music Centeral and Huntly Writers as part of the New Words 2011 festival. 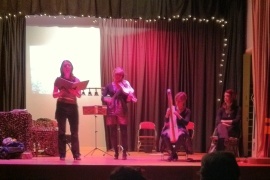 Paulina's poems were complemented by readings from Lucy Aykroyd's walking diary and music associated with the ancient pilgrimage route performed by medieval music ensemble The Artisans. After a bit of a sabbatical from cultural activity for reasons that would really bore you dear reader, I, fortified by a good meal and a glass of wine, attended this poetry, prose and music event. Ready for anything because you never know and it is best to be prepared. I hoped I had managed to get enough wine down easily-made-grumpy friend. Walk the Way told the story of the epic five hundred mile Santiago de Compostela pilgrimage, also known as the Way or Camino. 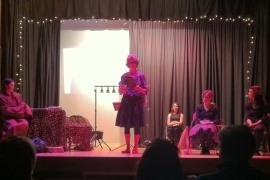 The story was told using poetry, prose and music. Paulina Vanderbilt, whose book The Way: a poetic pilgrimage, based on her personal experiences of the Camino, was being launched at this event, read the punchy evocative poems from it. She also provided a lively prose narrative tracing its history from earliest beginnings in the ninth century to the continuing popularity it holds today for people of all faiths or none. Lucy Aykroyd, who completed the whole five hundred miles last year straight off (phew!) 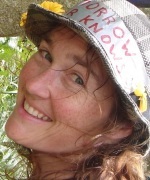 read complementary extracts from her soon-to-be published journal Leaf or Lizard: Shoe String Tales from the Camino. These readings intertwined with mediaeval songs and music relating to the Camino by The Artisans, a talented group of musicians from London who specialise in early music. 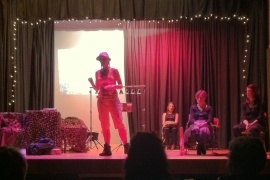 The performance overall was entrancing despite an odd set-up. Right at the back of the stage there was a projection of pictures of the Camino beaming out from a gap in black curtains which were decorated by a framing of little white lights. This meant that the performers were back-lit as the main hall lights were switched off for both halves of the programme. Some audience members who, like me, were sitting at the back of the hall found this disconcerting especially Easily-Made-Grumpy. I don't think that those who got a seat nearer the front were affected. Should have got there a bit earlier and got a seat at the front and I would have heard the voices better as well. I'll know next time. However, after a while I found that the impression of looking into the sun zoned me completely with the whole notion of a penitent pilgrimage in climes a lot warmer than Scotland. The fact that the performers were in silhouette also lent an other-worldly feel to the whole thing. Indeed the words of Vanderbilt and Aykroyd spoke of how the Camino is a state of being rather than an objective to be accomplished. how the bread-and-water trail feeds us. The hypnotic rhythms of the music maintained the effect. When Yvonne Eddy sang the marvellous Alleluya Vocavit Jhesus I was quite prepared to believe I was at that moment hearing an angel. What else is there to say? One poet, one chronicler and the Artisans had never met face to face before. The Artisans had travelled that day from London and had been on the go since early morning. They had about two hours to sort themselves out. A miracle took place. A marvellous evening. A seamless performance. That's professionalism for you. The depth and humanity of Vanderbilt's poetry, the engaging honest humour of Aykroyd's journal and the truly beautiful music and song of the Artisans blended like grace and transported us all. Easily-Made-Grumpy just shut his eyes and listened and solved his problems that way — Camino style. Worked better than wine. P.S. It is perhaps worth mentioning that this concert was brought to Huntly in a collaborative effort by Music Centeral and Huntly Writers. These local groups are dedicated respectively to promoting music and creative writing in the area. Their collaboration shows how the combination of the vision and passion of two separate groups can provide an opportunity for artists from different disciplines to interact in ways which can enhance both their performance and audience experience. Vanderbilt's book The Way is published by Blue Salt (£9.50) and contains photos, notes about Galician folklore and some yummy Galician recipes as well as other good things. Copies of the Artisans' early music CD can be ordered from their website. Paulina Vanderbilt mostly writes poetry but has a number of short stories and even half-finished novellas stashed away in her drawer – waiting their turn. She describes her poetry as a watercolour of impressions, vibrant and immediate. She lives in Holland now, but Scotland is the bones of her. Paulina recently set up her own creative writing business to take her energetic, slightly chaotic approach to creativity to schools in Holland and the people in The Hague. 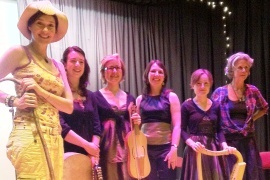 Her second collection The Way: a poetic pilgrimage was launched at this event in Huntly. Her successful first collection, In Search of Salt (Koo Press, 2009) is available by special request.